There is something continuously happening at emuamericas. 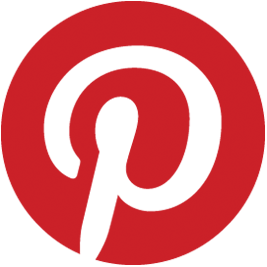 Check back here for our latest information on upcoming trade shows, advertising and news about us. New this year are the Allegra Side Chair and Armchair. The curve of the seat and back is perfection, providing a comfortable resting place for any outdoor patio. Available as Quick Ship in Antique Iron. 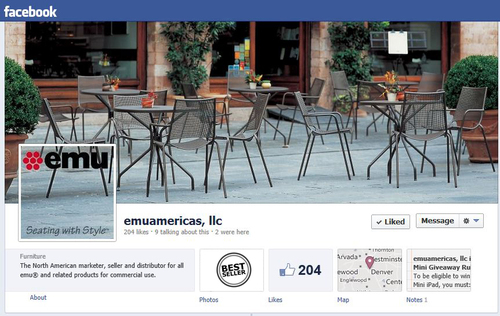 Visit www.facebook.com/emuamericas for the latest information about products, news and events. 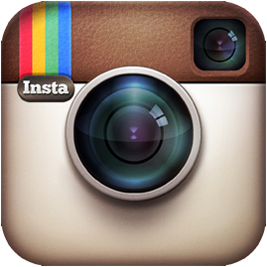 Is your patio Front Cover Material? Share your patio photos featuring emu products either on our Facebook wall using #PatioContest or submit photos at http://emuamericas.com/submit_your_install Winning photo will be featured on the front page of our 2014 Pictorial Index! 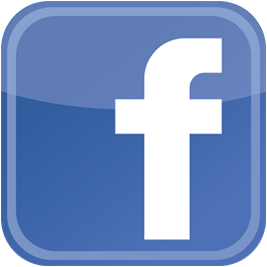 emuamericas is now on Facebook! 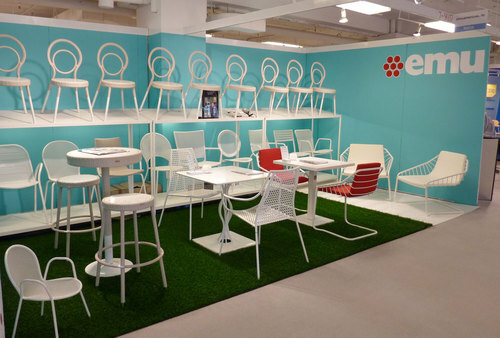 emuamericas’ booth welcomed summer. 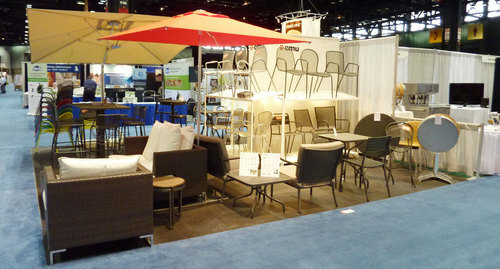 The new Charleston #6571 chair made a strong impression with its unique seat back design while the newly introduced Cantilever collection was the hit of the show. Cantilever seats offer a nice spring movement, not only providing comfort but creating a fun atmosphere. 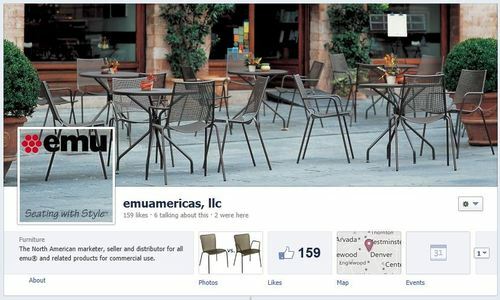 emuamericas has your outdoor seating needs covered! 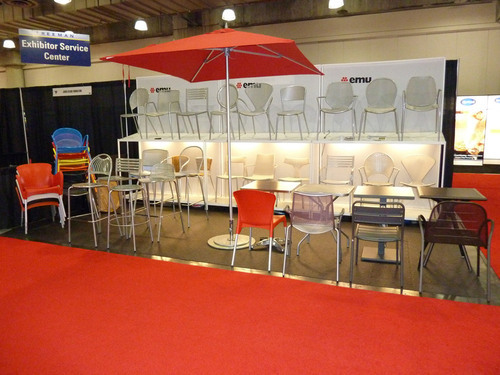 emuamericas displayed all of its chairs, barstools, tables, lounge seating and umbrellas suited for the foodservice & hospitality industries. All of our finishes were also at hand, including the newly introduced Antique Black. Several items are available as quick ship, please refer to each product’s details for full information. Relax with emuamericas! At the recent HD Expo, we introduced several new lounge collections, including the elaborate workmanship of the Shalimar collection, the simple yet elegant Intrecci Relax, and the new mini Jerra sectional overshadowed by the new Shade Cantilever umbrella. Also shown was the new Cantilever collection giving a unique seating sense, plus the newly added complements to the Vera Collection. Charleston made its debut with its unique and original design, both as a side chair, barstool and matching tables to complement. Call it a one-stop shop for outdoor furniture. This year’s space gave us the opportunity to display the entire emuamericas collection; from steel, to aluminum and wicker products, in dining, bar height or lounge, it was truly a one-stop shop for outdoor furniture needs for either restaurant or hospitality projects. Our 2010 new introduction of Way is now available for immediate shipment. The collection includes a side chair #141, an armchair #142 and a barstool #143. A very sturdy chair and barstool for the commercial use due to its square tube and addition stretchers for support in those high traffic areas. The finish options are Aluminum, A/Iron and A/Bronze. 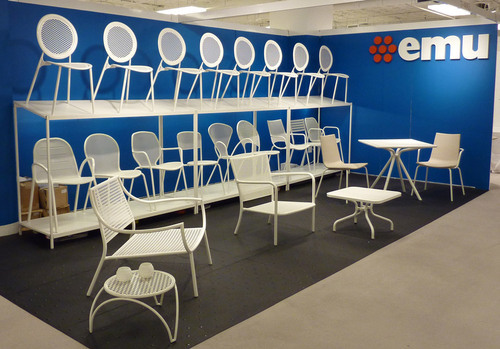 emuamericas shows its latest collection of products suited for the corporate market. The new Antonietta #3396 received continued attention, in addition to the Way collection. The Vera Lounge was featured with its retro look and unusual arm design which makes it a grand statement. 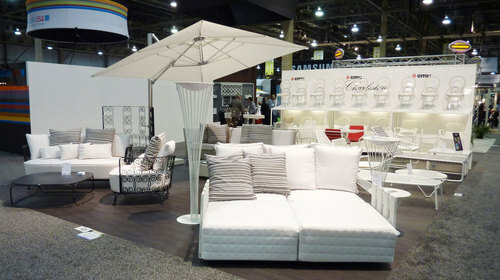 Black and white was the inspiration of our booth at this year’s HD Expo. Antonietta side chair #3396 stole the spotlight as emuamericas mostly displayed items from its hospitality collection, including the new Vera Lounge collection featuring an armchair and a sofa with stylist occasional tables. The Luxor and Jerra collections prominently stood ground in the booth showing it as an emuamericas staple for the hospitality market. 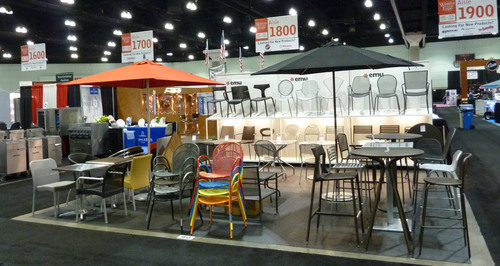 emuamericas has your outdoor needs in stock available for immediate shipment. As Chinese manufacturers have challenges shipping its product from oversees, emuamericas continues to receive its product from Italy without delays. We offer several items in different finishes as quick ship; please refer to our price list or pictorial index to view our quick ship items. We made heads turn with the newly introduced Antonietta side chair #3396. A sophisticated chair that recalls the elegant armchairs of the 19th century. The shapes play with the versatility of metal in order to obtain comfort and convenience. 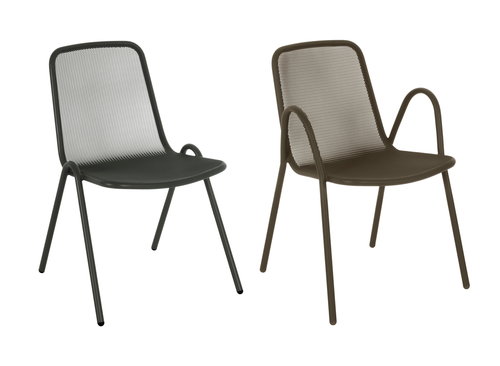 Due to its popularity, the chair will now be stocked for immediate shipment in Aluminum, A/Iron and A/Bronze. In addition, the attendees had a chance to try the comfort of several of our best selling chairs and barstools, and see the different construction of our tables, all for outdoor use. Thank you for making the show a success! We are excited to release our new website! We have majorly overhauled our website for ease of navigation and make it an informational database for all emuamericas products. Need to find a product fast? Just search for it. Need to know what finish it is stocked in? Just take a look at the product details page. Need a measurement? You will find those on the product details page as well. Need to print a spec sheet? Go ahead, just click on the SPEC icon. 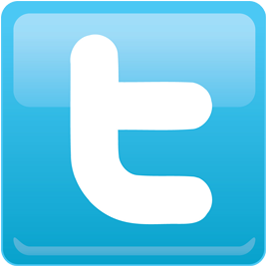 Want to get a quote? Just add the item in the QUOTE basket with the quantity and the preferred finish and we will have a local rep send you a quote within 24 hours. You will also have a chance to view several new installation photos in the foodservice, corporate and hospitality markets to give you some ideas for your unique location. Love your emu products? Send us your installation photo and we will share it with our community.